Thought to be descended from the drover dogs of Ancient Rome, the Rottweiler has long been a working breed. The Rottweiler is a medium large, robust dog with a compact and substantial build. They should stand 22 to 27 inches at the shoulder, with males being larger then females, and should stand down with good substance of bone. Rottweiler’s are black with clearly defined rust markings. 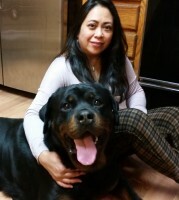 The Rottweiler is an intelligent, self-confident breed with an inherent desire to protect home and family. This breed is a hardy, adaptable and willing to work. This makes the Rottweiler a popular police, obedience, guard as well as companion breed. Click on the links below to visit the Rottweiler breeder websites. Click on the “Breeder Services” to the left to submit your website or to have CaninePlanet.net build a web site for you. The Bullmastiff is a large dog created by English gamekeepers who needed to protect their land and stock from would-be poachers. Bullmastiffs were derived from breeding Mastiffs with Bulldogs, the end result was a formidable guard dog that is about 60% Mastiff and 40% Bulldog. They are a well-balanced animal, with great strength and endurance. They have a large skull, broad muzzle, keen expression, and a fair amount of wrinkle about the head. The Bullmastiff is a heavy boned breed, and weighs between 100 and 130 pounds. The coat should be short and dense, with acceptable colors being fawn, red or brindle with a black mask. A small amount of white is allowed on the chest. Click on the links below to visit the Bullmastiff breeder websites. Click on the “Breeder Services” to the left to submit your website or to have CaninePlanet.net build a web site for you. The Boxer is a working breed that is strong and purposeful while still remaining elegant and stylish. They are full of dignity and alertness, a make an excellent guard dog. The broad, blunt muzzle and chiseled head are the unique hallmark of the breed, and carefully considered in the show ring. The Boxer should have a short coat, with acceptable colors being fawn or brindle, white markings are not to exceed 1/3 of the entire coat. Boxers are a large dog, and should stand 21 to 25 inches at the withers; males should not be under the minimum or females over the maximum. Click on the links below to visit the Boxer breeder websites. Click on the “Breeder Services” to the left to submit your website or to have CaninePlanet.net build a web site for you. This working breed is one of the oldest sled dogs. Being from the Artic, the Malamute is a double coated breed, with a thick, course guard coat and a dense, woolly undercoat .They are a a well muscled, heavy boned breed with erect ears and a broad, alert head. The Malamute is a well proportioned dog about 75 to 90 pounds. Malamutes are affectionate, playful companions, and usually friendly to new people. Click on the links below to visit the Alaskan Malamute breeder websites. Click on the “Breeder Services” to the left to submit your website or to have CaninePlanet.net build a web site for you.